I know, I know, I took my sweet time putting this race recap together. Let’s be honest, it’s basically pure laziness that kept me from writing this. I actually had a post that was mostly finished but magically deleted itself. Oh well, I’ll try to remember as many details as possible!. Monday: 1 mile warm up, 6×1 mile with .2 mile recovery (8:34, 8:09, 7:51, 8:04, 7:50, 7:49) 1 mile cool down. My legs were feeling heavy and tired so I skipped Friday and Saturday hoping that would help them rest up for race day. Seth took Saturday off work and we headed to Steamboat bright and early with a stop at the shooting range in Walden, of course. 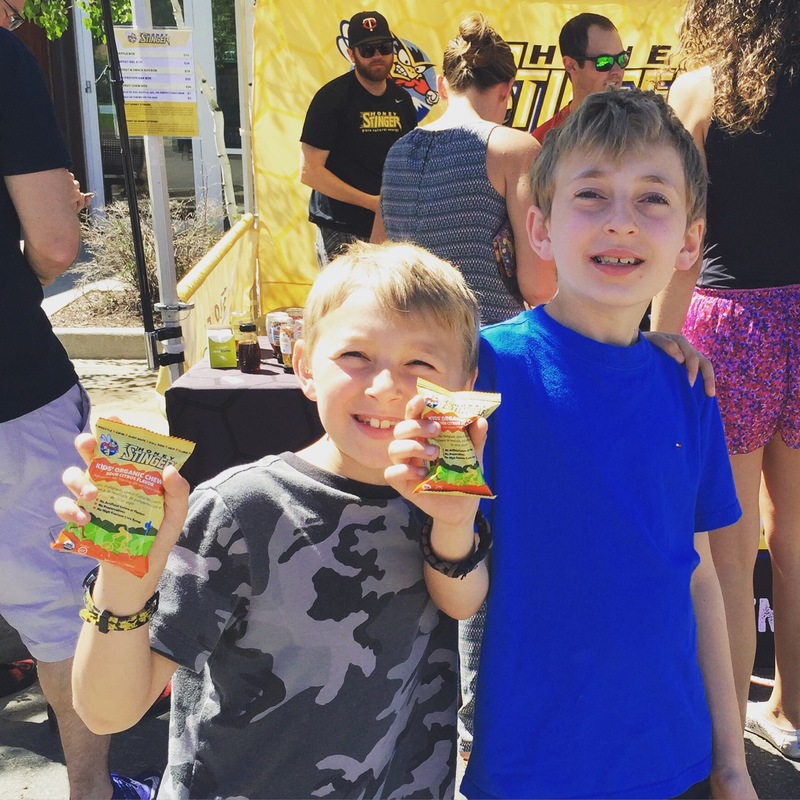 Once we reached Steamboat, we stopped at the race expo to pick up my bib and the boys made a “beeline” for the Honey Stinger tent. They love those waffles! 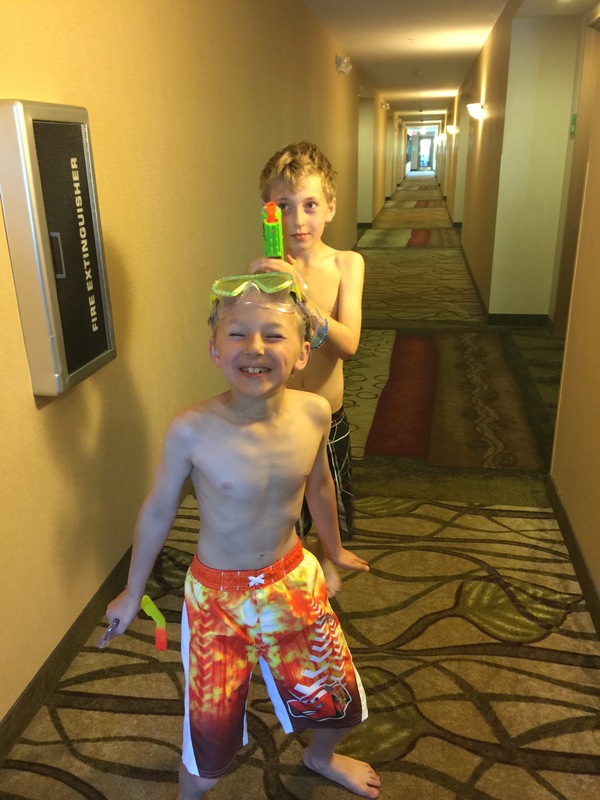 After checking into our hotel, we spent the rest of our afternoon swimming – definitely a highlight for the boys! 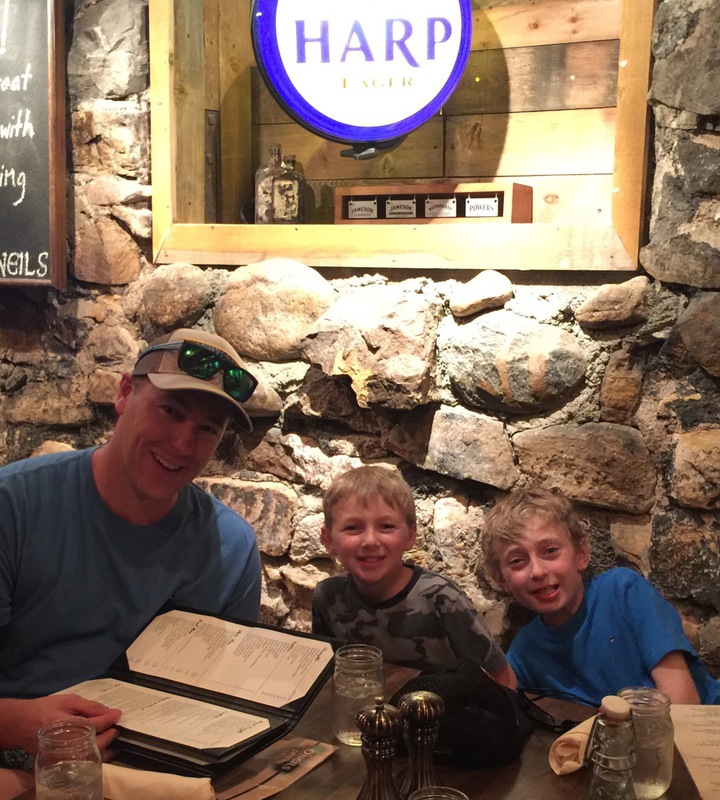 Our next stop was downtown for supper. 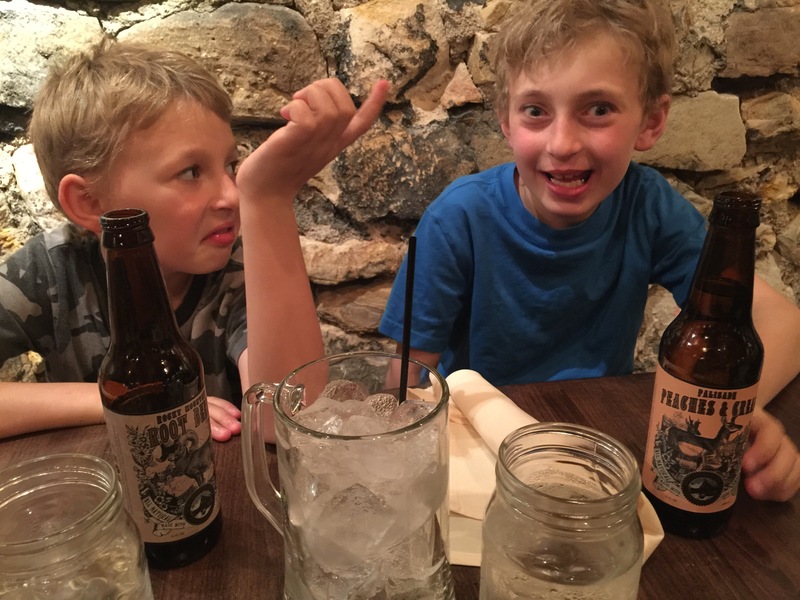 Not sure what the boys were discussing over their root beers, but it must have been amazing. I’ve been mostly vegetarian for nearly a year and I did that one thing you’re not supposed to do the night before a marathon. 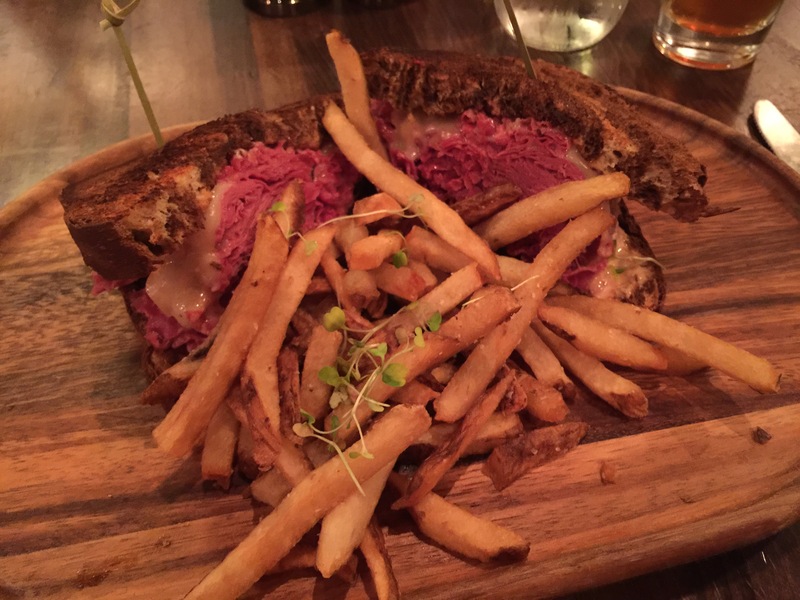 I ordered and ate a giant reuben, greasy fries, and a beer. It tasted so good in the moment. After dinner, we headed back to the hotel to hang out and I set out my race kit for the next morning. Not pictured: sunscreen and bodyglide that were liberally applied the next morning. The sunscreen worked. 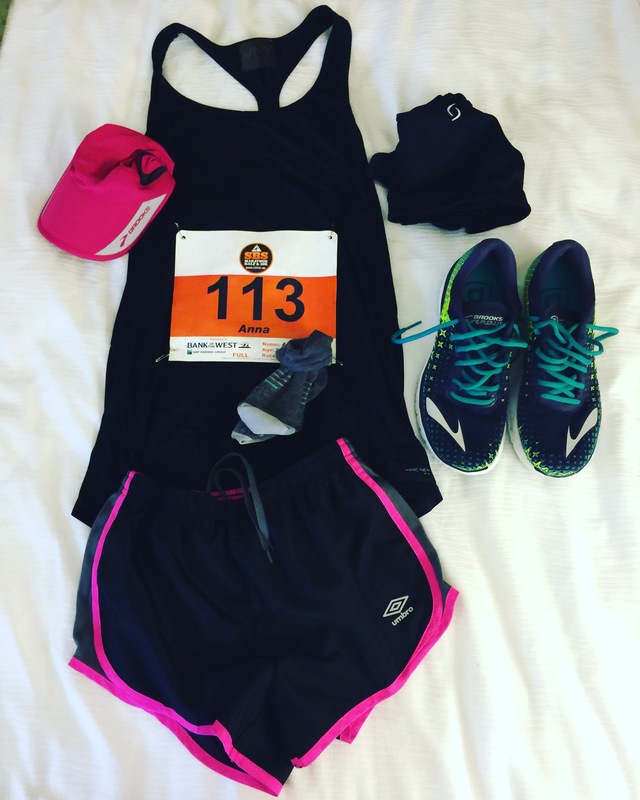 The morning of the race, I got up, dressed, applied sunscreen, drank a cup of coffee, ate 2 granola bars (new breakfast on race day – oops!) and headed downstairs to the hotel shuttle. We stayed at the Holiday Inn (putting those IHG points to good use!) and they offered a free 5:30am shuttle to the bus loading area by the courthouse. I used this last year and it has always worked out great. All of the buses were lined up on the street behind the courthouse with full marathon buses on one side and half marathon buses on the other. 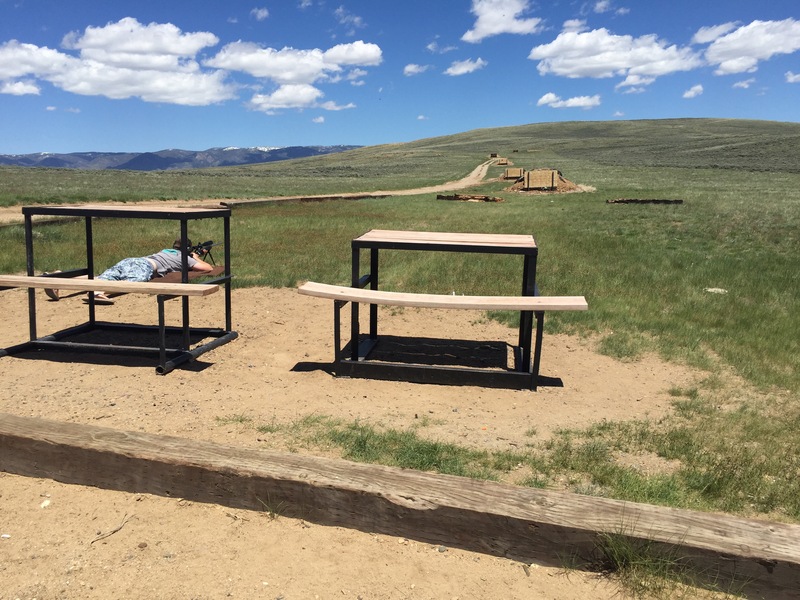 After boarding the bus and finding a seat, I began to feel a twinge of nervous energy but tried my best to stay calm and enjoy the ride up to Steamboat Lake. It was already starting to feel warm and the day was supposed to be hot so I was happy that I had chosen the coolest (although, very unflattering) running gear I owned. At the lake, I got off the bus to use the restroom and then climbed on the bag bus to stay warm until the start. Unfortunately, it was already feeling warm on the bag bus so I knew I would be in for a hot morning of running. I applied bodyglide, handed my bag over and walked to the start where I took a gel and drank two cups of water. Before too long, the gun went off and away we went. My plan was to use the first 3 miles as a warm up and then pick up the pace. The morning was clear and sunny and I was feeling good, but a little out of breath due to the altitude so I tried to take it easy and run off effort instead of the pace that I had planned. So I passed the women with no sense of humor and caught up with the man. I said hi and commented on what a nice day it was as I passed. He sped up to match my pace and started chatting between breaths. We had both been shooting for a sub 4 but knew that it wasn’t going to happen that day. A friend he was running with had dropped out with a foot injury at the first aid station and my new friend was struggling to keep his planned pace too so he asked to stick with me. I was struggling to maintain close to a 9:00 pace and failing miserably. My new friend stayed right at my shoulder though and always managed to catch up each time I began to pull away. He was huffing and puffing harder than me but managed to tell story after story between breaths. He had been bit by a rattlesnake two years ago during a trail run so he told me all about how he had survived that. 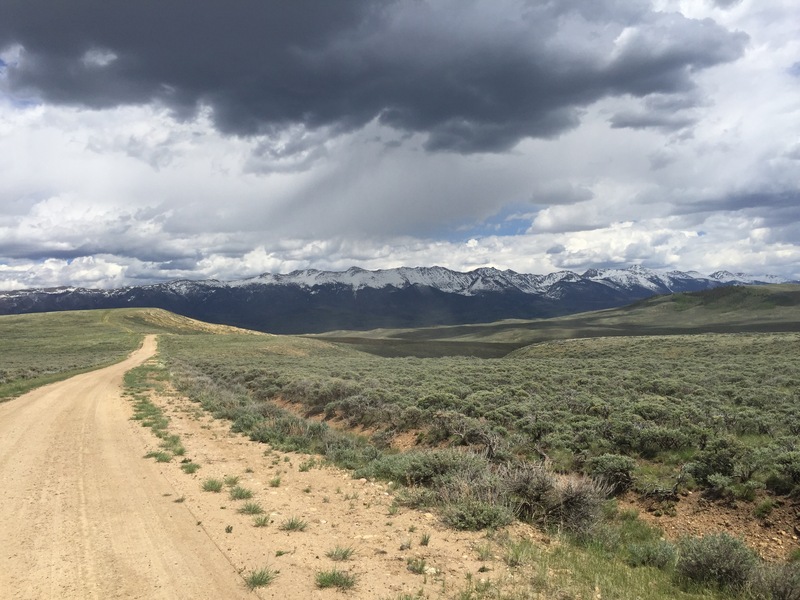 We finally began to speed up a little as we hit more downhill sections and my new friend commented on how nice it was to have someone to pass the boring middle miles of the race with – it was. Then, he told me about being hit by a car during an icy run last winter and we saw a man dressed in a sasquatch suit walking down the road waving to runners. It was starting to get uncomfortably hot in open spots on the road but I was taking in a water and a sports drink or two waters at each aid station and fueling with a gel every 45 minutes. My new friend told me about a time he was swimming in the ocean 20 years ago and was bit by a shark. I was starting to hurt but his stories were entertaining enough to distract me. It was really starting to get hot and the big hill in mile 17 was un-fun. The bodyglide I had applied earlier was completely worn off and my arm was chafing my back fat like crazy. One of the aid stations had a stick of bodyglide set out and I stopped to reapply. It was amazing for a few minutes but I was so sweaty already that it didn’t work well for very long. My new friend told me about how hard marriage and raising children is but how great his two grown daughters had turned out and how proud he was of them. He told me about his 30 year marriage failing. It was hard to hear the sadness in his voice as he talked about thinking they would always be together and not realizing how much resentment had built up over the years until his wife insisted that they begin couples therapy and their relationship rapidly deteriorated. I’m always curious about what causes long marriages to end as my parents divorced last year after 30+ years of marriage. Hot, hot, humid, hot and no shade is how I would describe this section. My hips, legs, feet and chafed arm were screaming that they were ready to stop. The mile 21 aid station was dousing runners with a water hose so I stopped and it felt freaking magical. My new friend decided to drop back and I ran on from there alone……..in the hot, hot, sun. A volunteer at the next aid station offered to dump water from a cup on me and, when I accepted, propelled me down a gauntlet of volunteers who all gleefully doused me in cold water. It was magical. With only 3.2 miles left to the finish and most of it downhill, I thought I would be able to speed up and hang on to a 9:00 pace. I was wrong. I tried to speed up again in the last mile only to feel a sharp, shooting pain along the outer side of my right foot. I limped along looking for the finish and just wanting it to be over. I passed another woman who had started to walk and my foot began to hurt so badly that I decided to stop and try to roll it out on a curb. The woman that I had passed started running again and she looked like she was in my age group so I scrapped the foot rolling idea and chased her down. After I passed her, there was one other runner between me and the finish but I couldn’t tell from the back how old she looked. 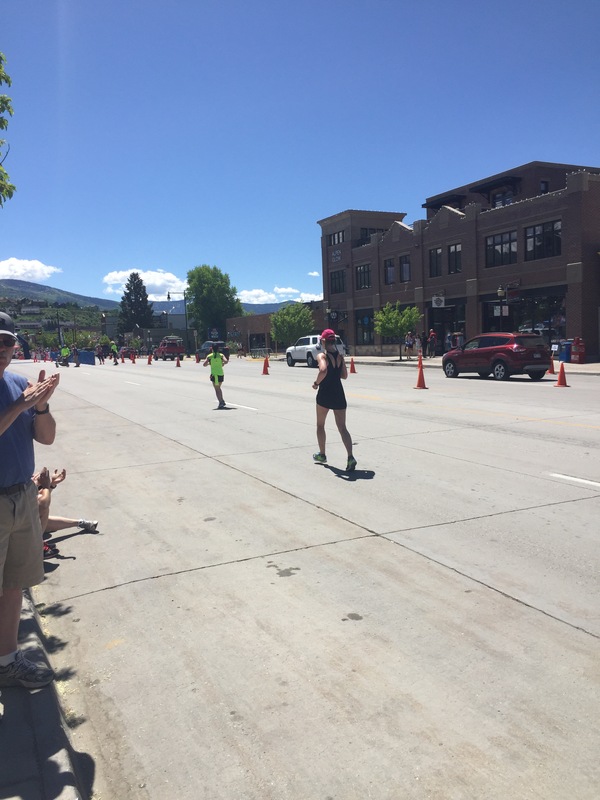 I passed her as we crossed the finish (douchebag move as I realized too late that I was blocking her finish photo) and the race was mercifully over. I moved up from 9th for the past two years to 8th in my age group. For a while after the race results were up, I showed as 7th but now I’m listed as 8th and the woman who I (rightly) guessed was in my age group beat me by 4 seconds even though she crossed after me. 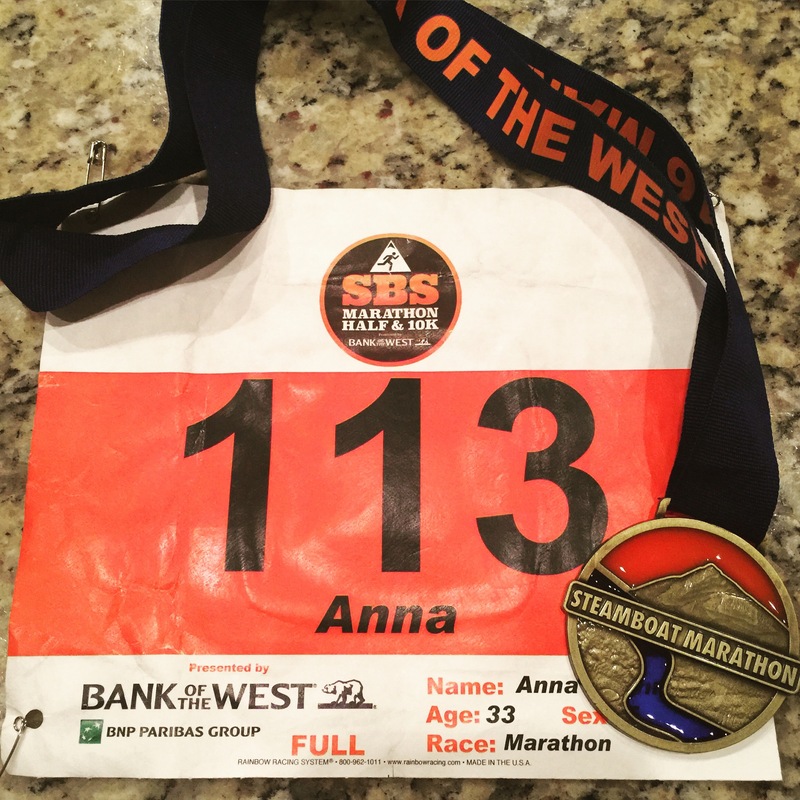 The Steamboat Marathon is a hard, hot, but beautiful race that is small, well organized, with awesome volunteers. I’ve looked forward to it every spring for the last three years, but I don’t think I’ll be back again next year because I want to try a new course next year. I’m not going to say I won’t ever run it again though – it’s my white whale! Next on the calendar will be the Equinox Half Marathon in Fort Collins and then I’ll decide if I want to run the Colorado Marathon next spring or train for shorter distances and then run a marathon next fall. Right now, I’m leaning toward a fall marathon so that I don’t have to spend so many cold, snowy mornings running in the dark! Thanks for posting, always enjoy the pictures.